We do LOADS and loads of kid's crafts around here. So what do you do with all of those paintings and artwork and beautiful one-of-a-kind pictures? You save some, give some to family, and the stacks of the rest...you can't save it all! 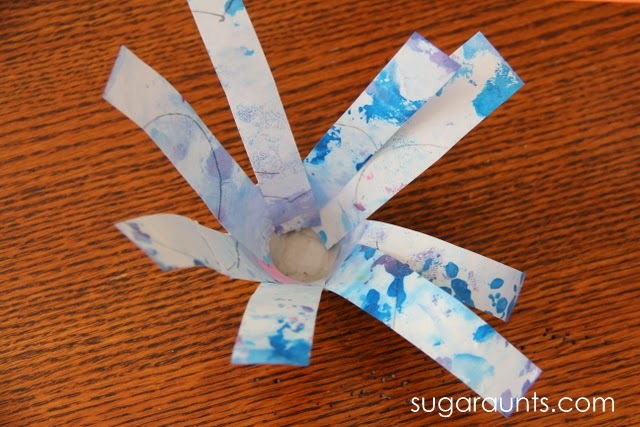 Why not recycle the artwork into more fun crafts? 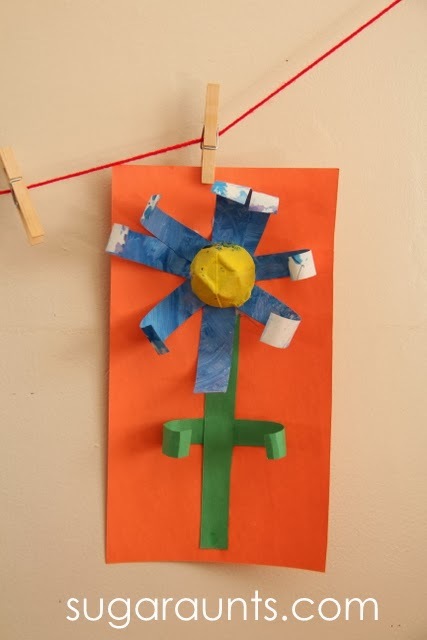 This Spring Flower craft uses some of those special paintings in recycled art! We've got lots of paintings ready to be used for recycled art. 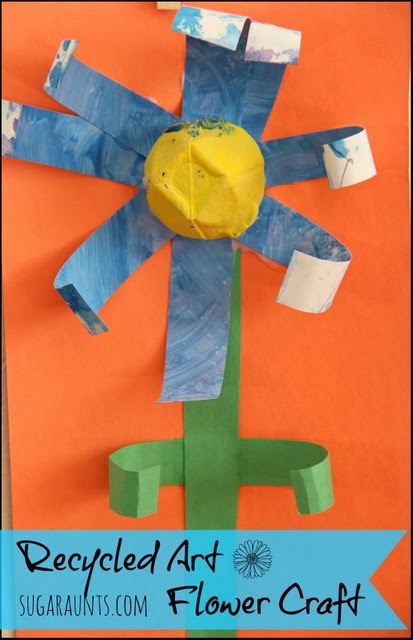 This Spring flower used a finger painting she made. 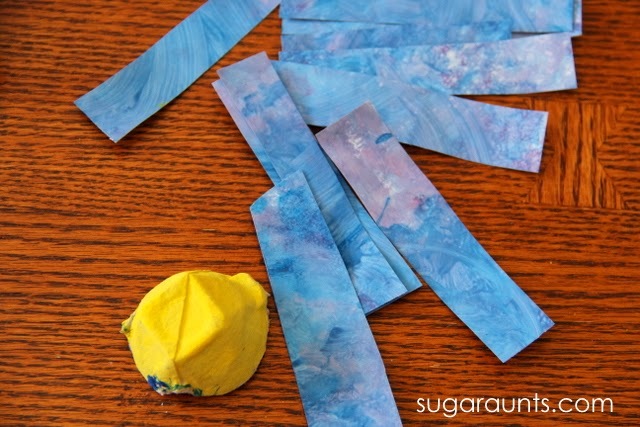 We started with her blue finger painting and cut it up into strips. This would be a great scissor activity for young scissor users. Cutting strait lines is a great way to develop accuracy with cutting lines and self-confidence with the scissors. 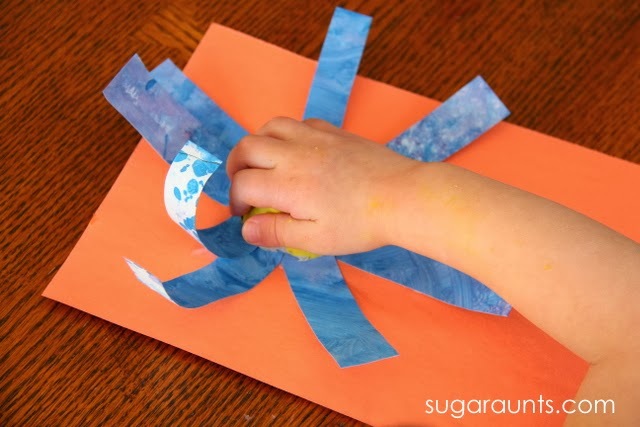 Draw strait lines on the backside of the painting and let your little one start snipping! Line accuracy doesn't matter, this flower will look great however strait (or not strait) the strips of painting. We used a yellow egg carton section from our painted rainbow egg cartons. Tape or glue the strips to the inside of the egg carton section. Add glue to the edge of the egg carton. Press it onto a sheet of construction paper. Add a little curve to the petals by rolling up the ends of the painting strips just a little. We added green strips of construction paper for a stem and leaves for our flower craft. Hang it up and enjoy the artwork for a second time around!